When you’re sitting in a manse high on the hill, it’s understandable that you don’t know what the rising water feels like when it comes up around your ankles. That doesn’t mean you have to sympathize with the quivering hands sticking desperately out of the water, witnessed from on-high through your binoculars. I would say I’d gladly buy a tank of gas to any Texan who can prove they’ve seen former Texas Senator Phil Gramm down at the Gas-N-Sip filling his own tank in the last six months, but even if he couldn’t afford to pay someone to do it for him, which he can, it wouldn’t make any difference, because it’s not going to mean a relative dime to his pocketbook. There’s nothing better about being rich than the contempt you develop for those so unmotivated and unpopular that they didn’t have the juice to develop the revenue streams and the connections to generate those revenue streams that would keep your mind on your business and off bitching about how much life costs. There’s a certain bootstrapping, Horatio Alger charm to that, but I see my barista and garbage collector straining and sweating at least as much and probably more than doughy Phil Gramm has ever done on his best day. Fred Barnes says “this was straight talk!…We haven’t had a recession. People think we’re in a recession….they claim about how bad the economy is, and it’s weak…although I see now that they have record sales at Wal-Mart, and people are right through this downturn spending like mad.” Yes, people will do that when they want to eat. There’s a school of thought that says we should take the callously wealthy and kill them. Just shoot them against the wall with a blindfold with pinholes so they can get a slightly obscured view of the gun that’s about to fire the bullet that’s about to execute them. It’s just another variation on “walk a mile in my shoes,” but it’s an important variation on that. 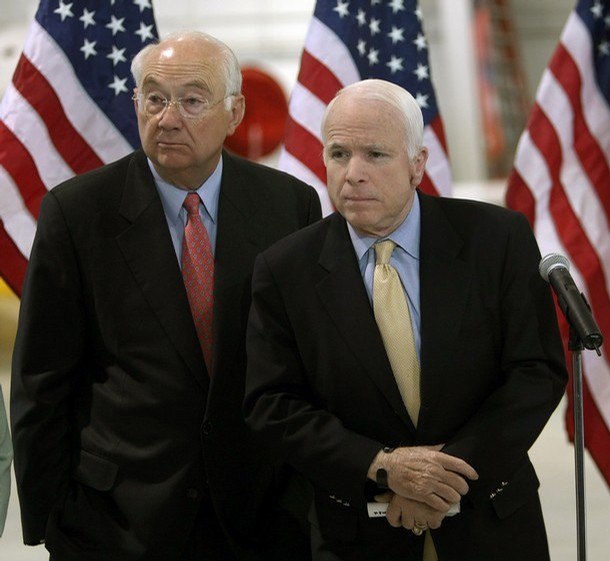 You would think that if Phil Gramm had any hope of becoming Treasury Secretary, or holding any other position within a McCain Administration, it would have evaporated immediately upon his impolitic, humanly tone-deaf comments; that he could hardly have done worse than if he’d accused the Jews of not conceding the efficiency of the Nazi rail system. But the McCain held their ground for several hours today. This was just ninety minutes before Gramm appeared before the Wall Street Journal Editorial Board as a representative of the McCain campaign–and repeated that we’re a nation of whiners. “I’m not going to retract any of it. Every word I said was true,” Gramm said. If there’s a hell for the wealthy, please let it be an assistant manager position at Hot Dog On A Stick.